By now, you've heard that the 89th Academy Awards ended with an M. Night Shyamalan caliber twist when La La Land was mistakenly named Best Picture only to have the producers jump up on stage and tell the world that Moonlight actually won. 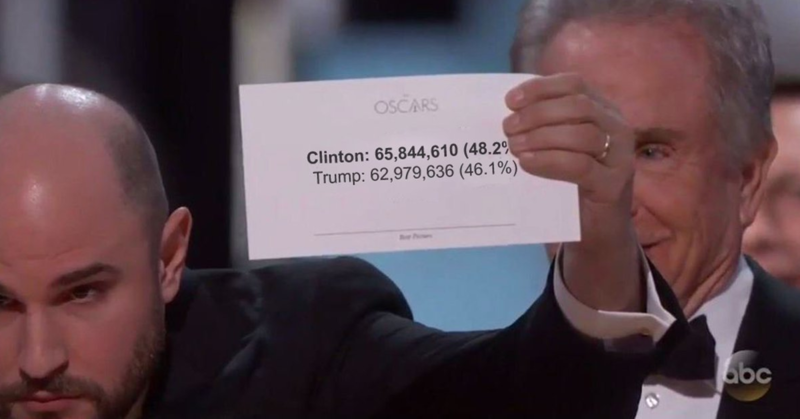 It wasn't until the very end of the Oscars that we finally got our meme of the night thanks to what some are calling Envelopgate, and now it's taking off in full force. All over the internet, people are taking the infamous envelope—which proved the error occurred backstage rather than being the fault of presenters Warren Beatty and Faye Dunaway—and Photoshopping it to hilarious effect. Some of them are political, some are random af, but they're all hilarious. Here are a few of our favorite Envelopegate memes so far. No kidding. If ever there was a time when an award clearly went to the wrong album, it was this one. Lemonade is ICONIC. At the very least it deserves a special Academy Award. A 6 for quality here but a 9 for the sentiment. I'm pretty sure everyone involved in that movie, including Jerry Seinfeld, has deliberately erased it from their memory. Speaking of movies we'd all like to forget. Try Best Picture EVER maybe! This one can't be restated enough. Hillary won the popular vote! Ugh, why did you have to remind me? The movie that made Mommie Dearest look like Citizen Kane. Seriously, this year has been on something. But this one might actually be the real card. After all, this is probably the most people have talked about an awards show in a long time. Kanye West is probably trying to figure out how he can recreate it the next time he wants to disrupt the Grammy or VMAs.